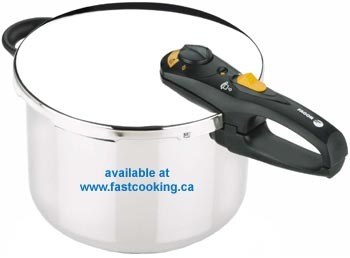 Fastcooking.ca - What pressure cooker size? There are a few things to keep in mind when selecting the size of pressure cooker. You shouldn't fill a pressure cooker more than 2/3 full. This keeps any debris or foam formed during cooking away from the vent so it doesn't get clogged. Keep in mind that you can cook small amounts of food in a larger pressure cooker, but you can't cook large amounts in a small pressure cooker. The 6 litre size is the most popular and is a good capacity for most recipes. If you want to pressure-cook a whole chicken without cutting it up or cook really large meat roasts, the 9.5 litre size would be necessary in order to fit the poultry or meat in the pressure cooker. Of course the larger sizes are also great for cooking large amounts of any kind of food. If you have a large family or are cooking especially large quantities, consider the 12 litre Kuhn Rikon Duromatic. The larger pressure cookers can also be used as light duty pressure canners. The Fagor Duo Combi includes the 8 litre Duo, 4 litre Duo, one pressure lid that fits both sizes, a tempered glass lid and steamer basket. A pressure cooker is very versatile. In addition to preparing meals in minutes, it can also be used to sterilize glass milk bottles for babies. Just pour water into the bottom of the pressure cooker, lock the pressure cooker lid and steam the bottles on the included pressure cooker steamer basket. ©2005-2010 Circular Input Products Ltd., All Rights Reserved. Problems or suggestions about website: contact .